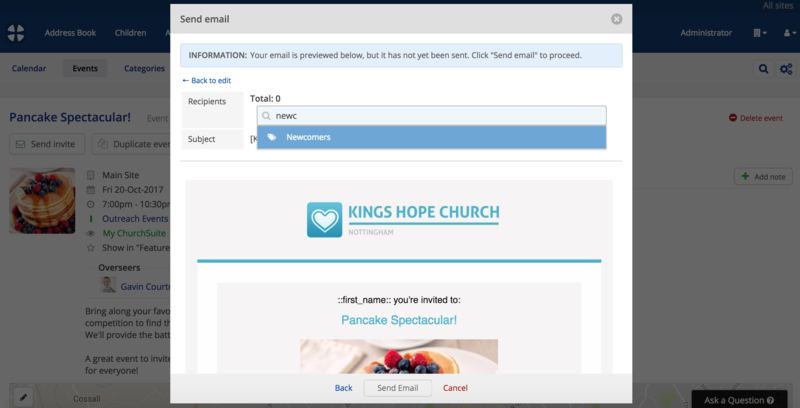 ChurchSuite's event invitation feature enables churches to invite certain people to an event by email invitation, and be able to track who has seen the invite, which people have responded to the invite and who is yet to respond. The user experience also makes engaging with your events simple and intuitive. Churches sometimes want to create "invite-only" events that are not publicly visible or open for general sign-up. Event invites are not dependent on the event's visibility settings. Invitees can accept or decline invitations even if the event is not visible in My ChurchSuite, Embed or Connect, like this example below. This would be an "invite-only" event. However, you can also use event sign-up for a targeted audience and have the event visible and open to sign-up by a wider audience in My ChurchSuite, Embed and/or Connect. 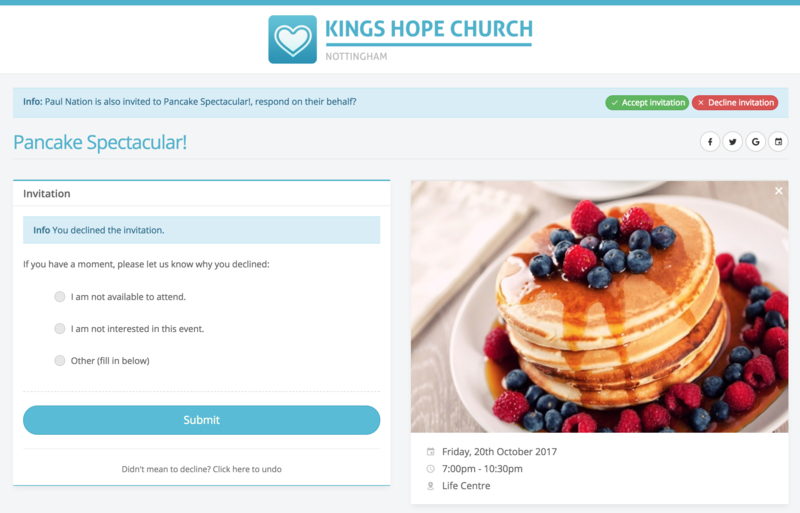 This might be helpful for a discipleship course, where you may have some potential guests in mind (to whom you'll send an event invite), but where others outside of the invitation list can also view the event and sign-up if they wish - in the following example, the event is visible in My ChurchSuite, Embed and Connect. Either way, ChurchSuite will match sign-ups against invitees (where sign-up contact details match the invitee) to keep everything up to date, so you'll always be able to see which invitees have signed up, even if they choose to respond outside of the invitation email, perhaps via your website if the event is visible there. In order for the "Send invite" button to be available on your event page in the Calendar module (far left button), "Sign-up though My ChurchSuite" and/or "Sign-up through Embed" must be enabled. Also, "Enable event sign-up" must be enabled in your Calendar module settings. 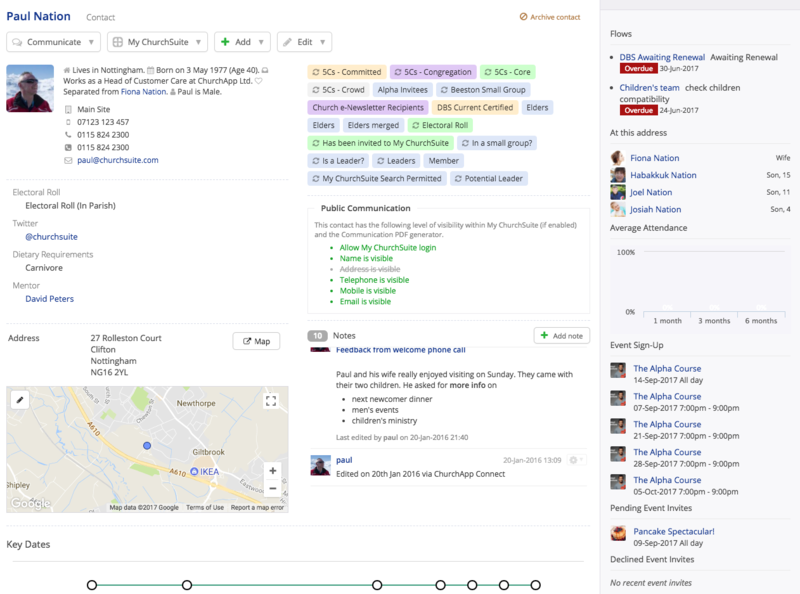 With an event already created, and the event visibility set as shown in the previous section, click "Send invite" at the top of the event's page within the Calendar module. You can only send invitations for future events, or for sequence events that still have future dates left in the sequence. You can now select the options to be included in the invitation email. Further customisation is also possible later when the draft email is being previewed, prior to sending. Note that you can either create a new "--Custom--" invitation (the default), or, if you have previously sent customised invitations for the event, you can select a previously sent invite version from the drop-down list. If your event has multiple ticket types you can select which tickets are to be made available to your invitees. 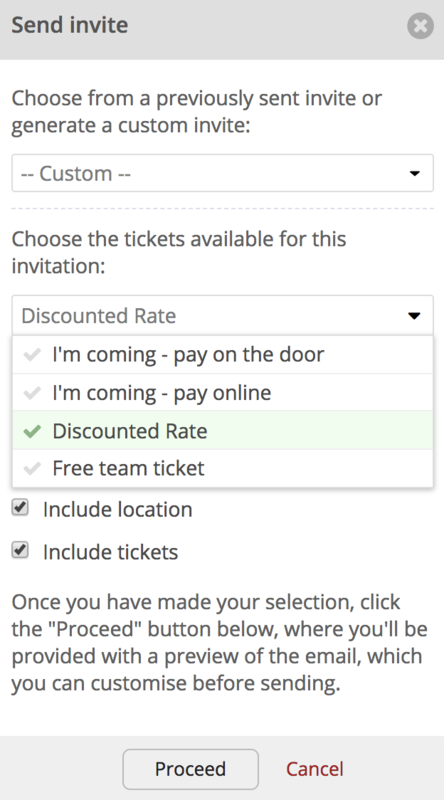 In this way you can easily make hidden tickets available to invitees, perhaps at discounted prices or for team sign-up, while still having regular tickets available to non-invitees (e.g. via your website). Please note that for an event with paid tickets, the tickets must be created and set active on the event before sending invitations. If this is not done and people "Accept" the invitation, they will be signed up for the event without a ticket, meaning that no payment will be processed. Click "Proceed" to see the draft invitation email. 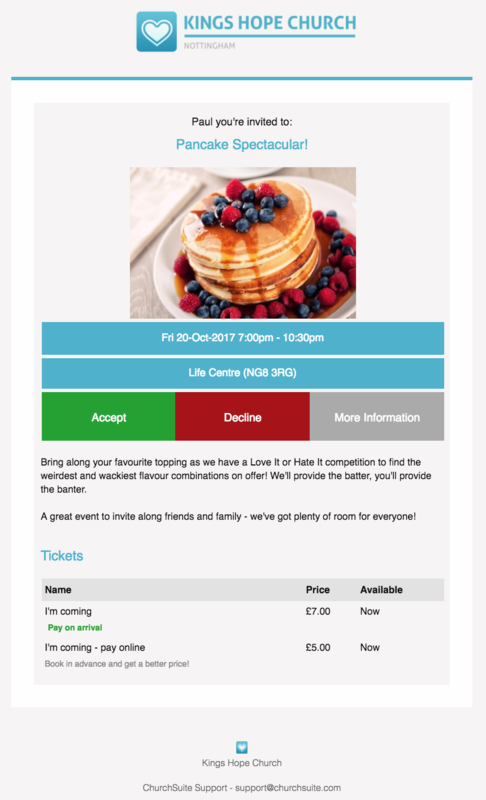 The draft invitation is displayed and branded based on the event's 'category', with the email subject and body pre-filled with content from the options you chose in the previous step. The email can now be further customised and/or branded prior to sending if you wish. For example, you can also add further merge fields, attach files, and set whether the invite email is to be scheduled (specifying the date and time the invite email is to sent). Click "Preview Email" to see the final email preview and select the invitees. 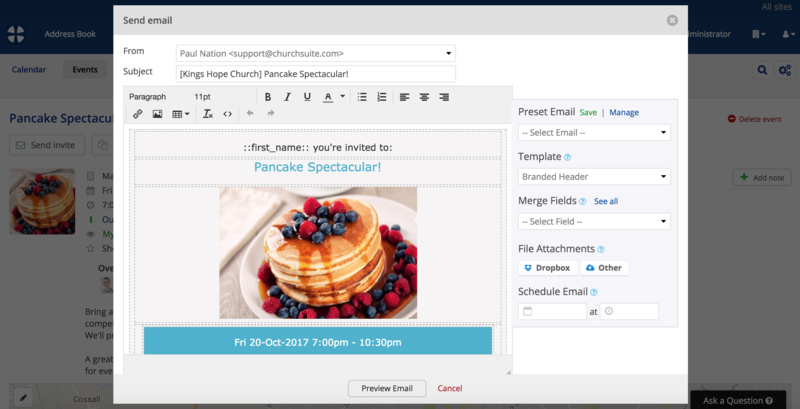 While ChurchSuite will automatically create a correctly formatted invite email as seen above, it's also possible to create and use your own Preset emails as invites if you wish. An invitation can contain any text or custom body content, however the email must include the merge field ::invite_rsvp:: in the email body to be a valid invite Preset. You will not be able to preview the invite email if this merge field is absent from the invite email body content. You can also use ::invite_accept::, ::invite_decline:: and ::invite_information:: as unique links, but they have to all be included in the Preset email body in order to send the invite. The final email preview is displayed (see next screenshot). Click "Back" or "Back to edit" to make further changes or corrections. You can now add recipients (invitees), either by searching and adding names individually, or by searching by Address Book or Children tags, which will add all tagged contacts or children to the recipients list. Note that you can send multiple invitations for an event, so don't worry if you don't create your full recipient list at this stage. The email preview also includes the "Accept/Decline/More details" buttons within the email body (which are disabled in the preview until the email is actually sent). Note: Invitees without an email address, or those who have 'opted out' of email communications, are clearly distinguished in the recipient list as "Not Sent". While no invitation will be sent to those people, they are still be added to the invited list for the event. There must be at least one "opted in" recipient with an email address in order for the "Send Email" button to become active - the "Resend invite" option (shown later) will not be available until the invitee has a valid email address. Any email addresses where the invite email bounces will be marked as "not sent" with a yellow warning triangle against their entry in the Invites list. Click "Send Email" (or "Schedule Email") and the email will be sent/scheduled. The sent/scheduled invitation email is recorded in the event's communication log, and in each invitee's communication log. Once an invite has been sent, the "Invites" tab is displayed in the same block as the "Sign-ups", "Refunds" and "Check-ins" tabs (although these other tabs may not yet be visible if there aren't any signups, refunds or check-ins). If an invitee has already signed up for the event then the invite will be displayed in the "Invites" tab with an 'Accepted' status, otherwise invitees are listed with a "Pending" status until they begin responding. Invites can only be sent to active contacts in your Address Book and Children module - it's not possible to send invites to individuals outside of ChurchSuite. 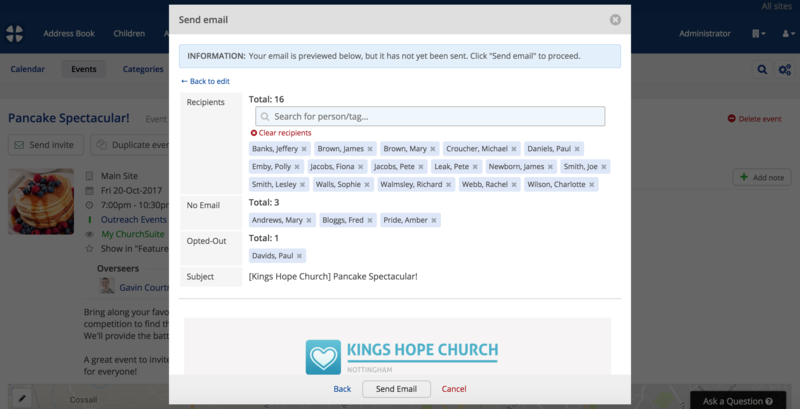 It is also not possible for event overseers to send invites from within My ChurchSuite, or monitor/manage invitation responses - this feature can only be used from within ChurchSuite, although overseers can view a 'sign-ups' list within My ChurchSuite. In addition to the subject and body content of the invitation email, the invitation email contains three 'action' buttons - Accept, Decline and More Information. The actions performed by these buttons is dependent on the event - whether there are tickets, multiple tickets, event questions, and whether the event is a free event or a pay event. Event invitation emails are delivered to the invitee's email address. Recipients can open the email and click the appropriate response from within that email. ...and, if the event itself is set as "visible in My ChurchSuite', on the actual event's page within My Events. The "Accept" and "Decline" buttons in My ChurchSuite work in exactly the same way as in the invitation email, covered in the next sections. If there are no event questions and no tickets for the event (or a single free ticket), the invitee is taken through to the event page where they will be automatically signed up. If their linked spouse/partner is also invited and their status is also 'pending', they will have the option to respond on their spouse/partner's behalf. In the example below, Mary has clicked "Accept", so her sign-up is immediately shown as successful with no further action required. However, she also has the opportunity to respond on behalf of her spouse/partner - clicking "Accept invitation" will sign him up - clicking "Decline invitation" will provide an opportunity for Mary to to provide a decline 'comment' on Jonathan's behalf. If the event has questions, or there are multiple tickets (free or paid), the invitee is also taken through to the event page where their contact details are pre-filled into the sign-up form. If a linked spouse/partner is also invited and their status is pending, they'll be asked if they wish to respond on behalf of their spouse/partner, which will create an additional ticket for them with their details also pre-populated into the same sign-up form. The invitee can then answer any event questions and/or select their ticket/s (and pay, if the event is a 'pay' event). Once the sign-up is confirmed, the invitee's status within ChurchSuite will update from "Pending" to "Accepted". Any linked spouse response will also update within ChurchSuite. If an invitee accepts a previously declined invitation, the status within ChurchSuite will update from "Declined" to "Accepted". Note, however, that it's not possible for an invitee to accept an invite after the event sign-up period has closed, although this can still be done within ChurchSuite by a user. If the event is visible, for example in your website, and an invitee chooses to sign-up manually, rather than using response buttons in the invite email, ChurchSuite will still match that sign-up against the invite list (as long as contact details match), and the invite status will be updated to "Accepted". To complete the workflow, the event's sign-up confirmation email (if enabled) is sent to signup (and to the linked spouse/partner if they are invited and accepted too). And finally, a signup notification is sent to the event overseer(s) if the "Notify signups" option is set for the event. Clicking "Decline" will immediately update the invite status with ChurchSuite to "Declined", with no further action required by the invitee. A message is displayed to the invitee confirming that the invitation has been declined, and allowing the invitee to select a 'canned' decline reason or to type a custom "Other" comment about why they're unable to attend. At this point the invitee can reverse their decline action (e.g. if they clicked 'decline' by mistake) by clicking "Didn't mean to decline? Click here to undo", which will set the invitation status within ChurchSuite back to "Pending" and empty any decline comments. They are then redirected to the event page where they can sign-up. An invitee can also decline on behalf of their linked spouse if they too are invited and their invite status is still "Pending". If the linked spouse has previously accepted, they cannot subsequently decline their spouse's invitation. If the linked spouse has previously declined, they can however subsequently accept their spouse's invitation. In this example below, the invitee has successfully declined his invitation by clicking the "Decline" response button. She now has the option to add a response reason, and she can also accept or decline on behalf of her linked spouse/partner Paul. Note that invitees cannot subsequently decline an invitation that has been accepted. In this scenario the invitee will need to contact the event organiser, who can manually decline the invitation on the event's page within the Calendar module. Note that is is still possible to for an invitee to decline (but not accept) an invite after the event sign-up period has closed. 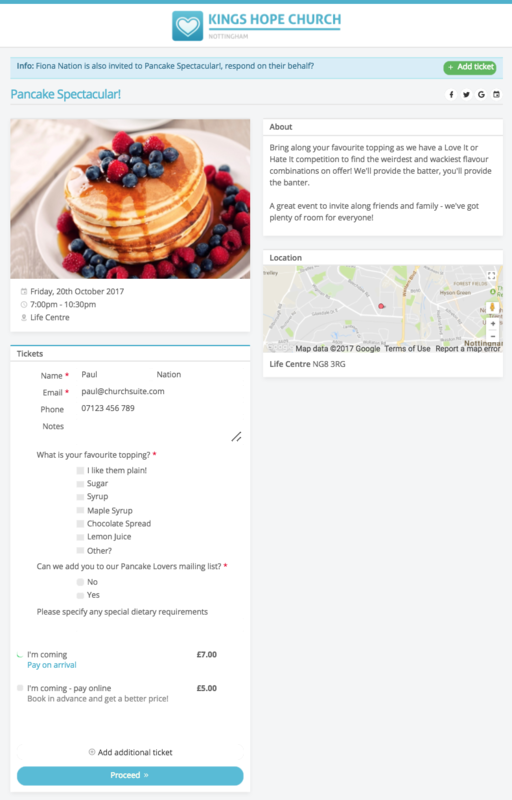 When an invitee clicks the "More Information" button within the invite email, they are redirected to the event page where they can read further information about your event - so they can see full details of the event location (and map, if the event location fields are correctly completed) and the event description. Their contact details are pre-populated into the sign-up form, but they will need to click "Confirm" in order to complete the sign-up. If the invitee's spouse is also invited and the status is pending, they will have the option to respond on behalf of their spouse. If the invitee has previously accepted or declined the invitation, the "More information" button will still open the event page so they can read the full event details. They can also undo a previous "decline", or add a comment to their decline (but not add further comments once the decline comments have been submitted). 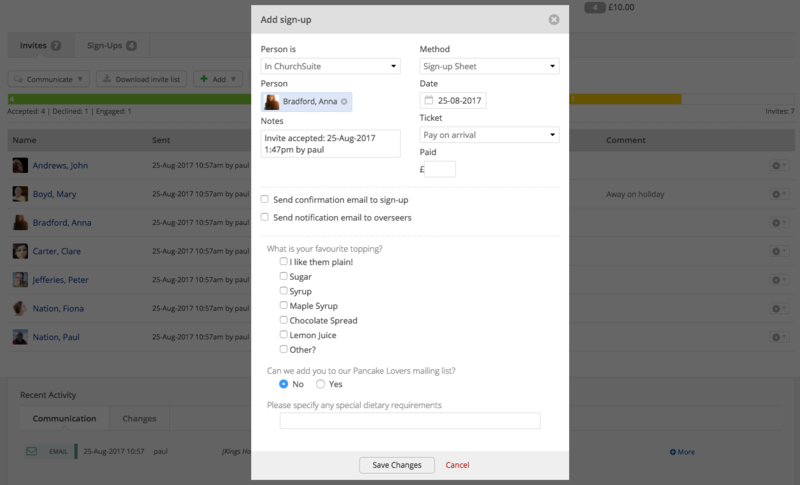 Users with 'manage' permissions for the Calendar module are able to manually manage the invitation process and response for invitees, for example, where the invitee doesn't have access to a computer to respond. Users can manually accept and decline invitations, and set an invitation status back to "Pending" (which will also delete any associated 'accepted' event sign-up, or any 'decline' comments). Sign-ups with a paid ticket must be refunded before the invite status can be manually declined or set pending. If a user manually adds a sign-up for an invitation event, ChurchSuite will attempt to match the sign-up to the invite, and the invitation status will change to 'accepted'; however they can't manually change the invitee status to 'accepted' without also adding the sign-up - a sign-up is always present for an 'accepted' invite. A simple progress indicator bar on the Invites tab shows the invite response with three metrics - Accepted (green) i.e. those who have either accepted the invitation, Declined (red) i.e. those who have declined the invitation, and Engaged (yellow) i.e. those who have opened/clicked the link. 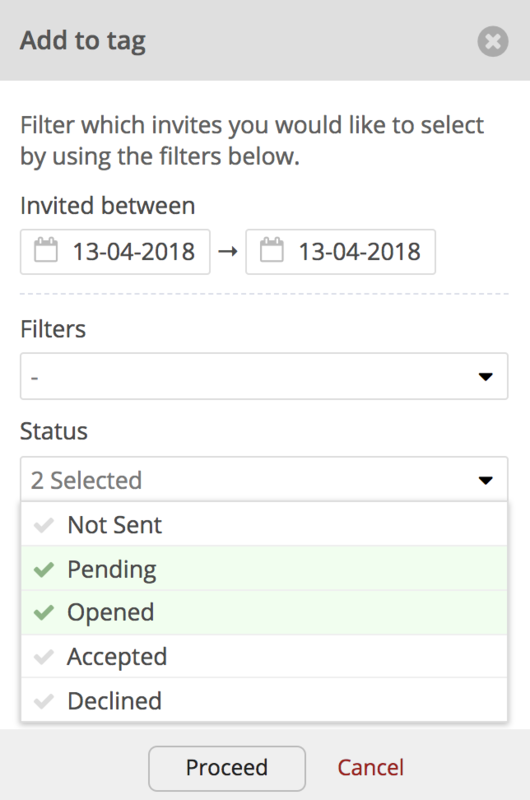 Users can easily resend an invitation to any invitee with a "Pending" status by selecting "Resend invite" from the action cog next to the invitee's name in the list (this will send a carbon copy of the original invite email). It's not possible to resend an invitation to someone who has declined. To resend an invitation to a group of individuals, you first need to create a tag. In the Invites tab, click 'Add to tag'. At this point you'll be able to select who to include in the tag. For instance, you might want to resend the event invitation to people with a Pending or Opened status. Name your tag and then use the "Send invite" button at the top of the event page to resend the invitation. You can also resend an invitation to existing invitees offering a different ticket type. Use the "Send invite" button at the top of the event page and select the alternative ticket(s). When re-sending an invitation to previous recipients in this way, their ticket choice will be updated to the newly selected ticket(s) when the new email is sent. Similarly, when a user manually processes a "decline" they can optionally provide a decline reason in the Comment field. The "Invites" tab displays tracking information about whether the invite email has been "Opened" - hovering over the "eye" icon will display the last known tracked 'open'. If the invitee has clicked through from the invitation email to the event page, we also log the "Click" icon as having been opened and clicked. 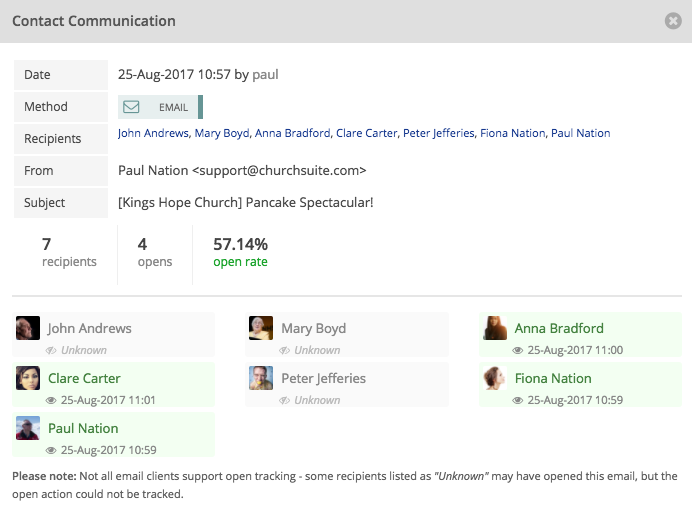 Note that not all email clients support open-rate tracking, so your invite email may have been opened but not reported back to ChurchSuite. We record the latest tracking information each time the invitation is opened or clicked - it's therefore not possible to see how many times (and when) an invite has been clicked and/or opened. If a user deletes a sign-up (or refunds a paid ticket, thus cancelling the sign-up) up relating to an invite, the invite status is changed back to 'pending' and a comment is added with a note of the user name and the date and time the signup was deleted. From the invite list, selecting "View invite" from the action cog next to any invitee will display the historic response activity of the invitation. You can also download your full invitation list at any time. The CSV file includes details of the invitees and response and tracking information. As with contacts and children on the Sign-ups and Check-ins tabs, you can also add your invitees to a Tag, Flow or Key Date, should you wish to perform other workflows using the same list of invitees. You can easily filter the invite list based on response status, perhaps just to see a list of those who have declined, or those still pending. Accepted, pending and declined invitations are also visible on each invited contact or child's profile page - notice the "Event sign-up" section in the grey summary panel on the right of the screen. Just as with event 'sign-ups' and 'check-ins', you have the option to communicate with the people on your invite list by email or SMS. When sending an email or SMS, you can further filter your communications by the engagement status (Opened or Opened & Clicked invites), invitee response status (Pending, Accepted, Declined), or by invitee "type" (either contacts "in Address Book" or "in Children" module). For example, using the "Engagement" filter on the Send SMS modal, you could text invitees for whom your were unable to send email invitations (i.e. invitees 'not sent'). Sent invitations and sent emails/SMSs are recorded in the event's communication log and also against each contact or child invitee in the communication log viewable within their profile page. Click "+More" to view the sent communication and the recipient list, along with the open rate tracking (viewable by clicking the open rate %).